After the tour for “Hold Your Fire”, Rush would start cutting back on their keyboards and samples, finding it a pain to reproduce live. 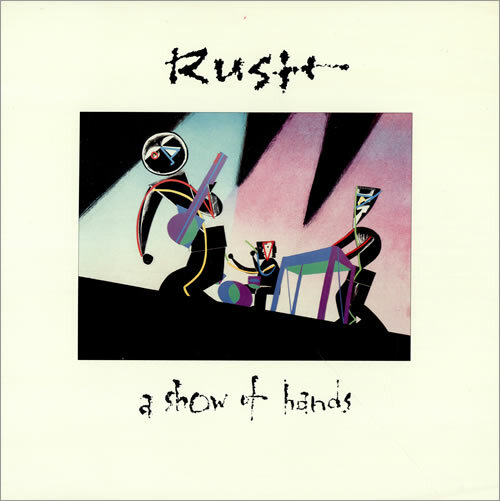 Thankfully they held off long enough to record and release their third live album “A Show of Hands”, which showed off music from (in my opinion) their most eclectic and esoteric era in a live setting. They still hadn’t completely learned their lesson from “Exit…Stage Left” though. While they didn’t tweak the sound as much, tracks are pulled from a total of five different shows (all in different cities) instead of just one like they later would do, including a few selections from the preceding “Power Windows” tour. Still, the performances themselves aren’t messed with too much and the passion and spontaneity in the playing is felt. I even refer to certain tracks as the definitive version of certain songs (particularly “Marathon” and “Mission”). The band even comes on stage to the sound of the “Three Stooges” theme song, showing off their sense of humor. And the reggae-tinged vamping during “Closer To The Heart” (the only pre-“Signals” selection including on the record, though others made it into the video version), where the audience really gets into it, is a great way to close the record. I have heard some complaints that Alex’s guitar sounds rather “thin” on this record, no doubt due to the solid state amplifiers and lack of distortion he was using around this time. I’ve heard this complaint about all the records through the Synth Era though, and I still say the energy and dynamics during his playing makes the guitar sound unique. It’s a matter of personal taste. And personally, “A Show of Hands” is my personal favorite Rush record, and a great way to close out my personal favorite era of the band.